God will send you down below! Now we all know there is no such thing as a free lunch. Hails from Coffee Helps, was singing my praises the other day. Usually when someone does that they are looking for something. The darling of Ballymena the European Grand Tour was no different to all the others, she gives me something and then she wants me to give it away…. Pick five blogs that you consider deserve the award for their creativity, design, interesting material, and also for contributing to the blogging community, no matter what language. 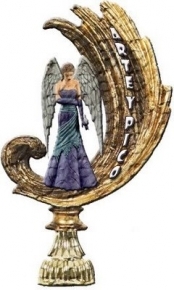 The award winner and the one who has given the prize have to show the link of the Arte y Pico blog, so everyone will know the origin of this award. I stopped at creativity and had no difficulty picking five blogs worthy of this accolade. Deborah at Tastie has a blog that I lurked on for some time before joining in the fray. In fact the very first time I braved her comment box I ranted on about a recipe and the way she suggested it should be made. I have come to appreciate her talents, her recipes and suggestions to help all our pockets at a time when prices are rising faster and more often that the sun. Last March I had the opportunity to enjoy her bubbly personality when we met at the Ladies Tea Party in the run up to the Irish Blog Awards. Deborah has now launched her own online food business specialising in Spice Mixes, Sauces and mouth watering Brownie mixes. Claire otherwise called Gingerpixel is a very talented unassuming young lady who again, I had the pleasure of meeting at The Ladies Tea Party. She is capable of bringing tears to my eyes as I follow her photo blog, and she regularly makes me feel broody with her portraits of babies and young children. I would not be Grannymar if I forgot to include a Toyboy. Phil at Iced Coffee is another talented Photo blogger. The images he captures leave me in awe. I hope that in studying his work I might improve my meager attempts behind the lens. Made Marian. has recently updated and moved house with her blog. The clean calm ordered lines are just as every craft workbox should be. Reading Marian’s blog brings back the enthusiasm that I felt in my early days as I embarked on each new area of needlecraft, whether it was embroidery, cross stitch, crochet or sewing. Marian I know you will enjoy Arte y Pico blog be sure to scroll all the way down. It is full of wonderful craft ideas. There are many more creative blogs out there but I was asked to select five. This entry was posted in Blogging on July 23, 2008 by Grannymar. I feel honoured to be presented with this award. Awh, thanks so much Grannymar, that has really brightened up my day. Keep that crafty advice coming too. I’ve already earmarked some of this months pay cheque to that cutting board, a steel ruler and a craft knife. Thanks for pointing me in new directions. @Phil & @Maz – I look forward to seeing who you choose to share the Award. @Steph – I managed to time this nicely today since the King, Damien Mulley has challenged us all to do our own Fluffy links today. ‘You’re not trying to get rid of me by any chance, are you?’ No way! Go check them out, but come back I need you to keep me on the straight and narrow. Great post GM – loving Made Marian!! That’s a great selection of blogs, I couldn’t agree more! I’ve added so many top quality local blogs to my reader in the past year, I barely get time to read them all. Keep up the good work everybody. @ellybabes, thanks for that, will check it out. @Elly – sad to say your A4 board is not a bit like mine and had you asked not one I would recomment. Also for Craft work A4 is not big enough. @Maz – See what I said to Elly. Go with Edding CM30 at least. I’m honoured and humbled Grannymar, thank you so much! Claire you are very welcome. keep those wonderful photos coming. You’re right, so many creative blogs but so little time to visit them all. I’m waiting for a ‘wet’ weekend to give me the excuse! @GM – seriously? I thought it looked the same in the photo… Still it’s only for trimming card & photos, so it’ll probably be OK.
@Elly – Seriously yes. It should be ok for trimming card and photos. I hope the sprain is healing!